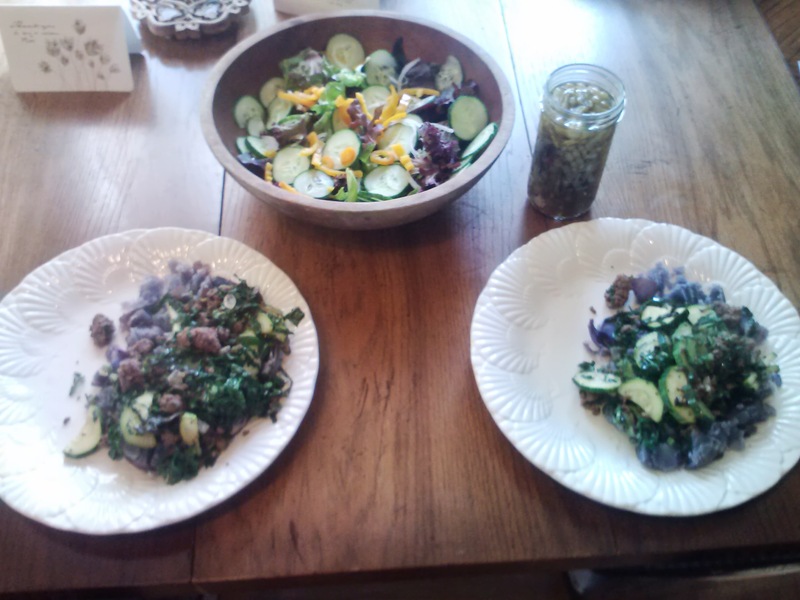 The recipe below was graciously provided by my canning mentor and sisterwife Elizabeth, also author of the My Ukiah blog. 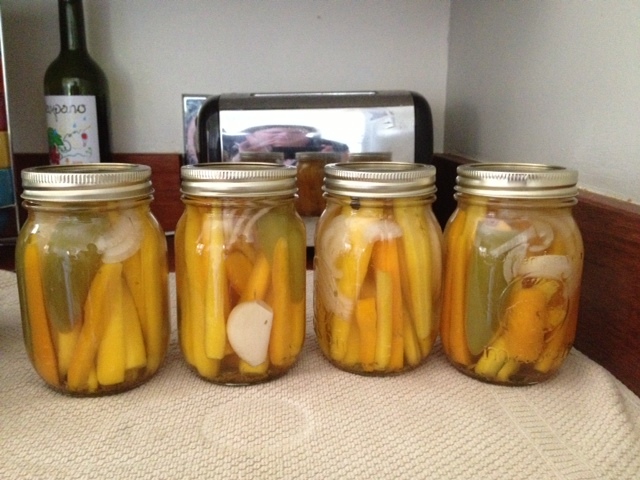 I have been making another version of this recipe which involves lacto-fermenting the pickles before putting them in the refrigerator. Will share that soon. 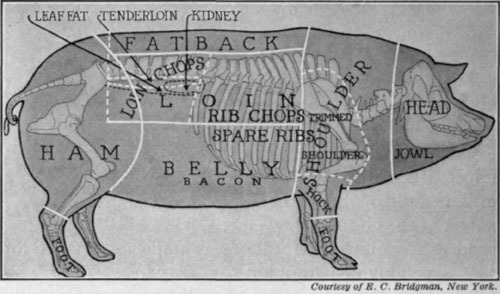 But for now, let’s start with the most basic of the basics (which is great if you’re afraid of canning, like I am). First, pick your recipe. There are a million books and websites to choose from. The most important thing from a food safety perspective is having enough acid in there to prevent bacteria from growing, which is not a problem given that pickles are packed in brine. For non-pickle preserving, most fruits are naturally acidic enough, though surprisingly tomatoes are not. This is a pretty simple fix and most recipes tell you to add lemon juice. 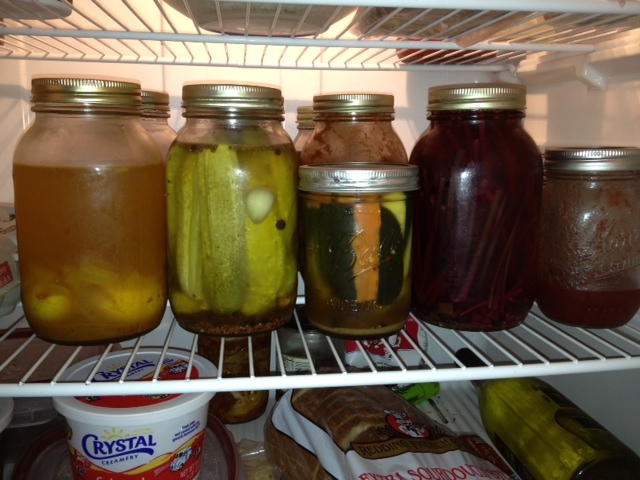 Right now I have jars of pickled zucchini, carrots, beets, radishes, eggs, and yes, cucumbers in my fridge. 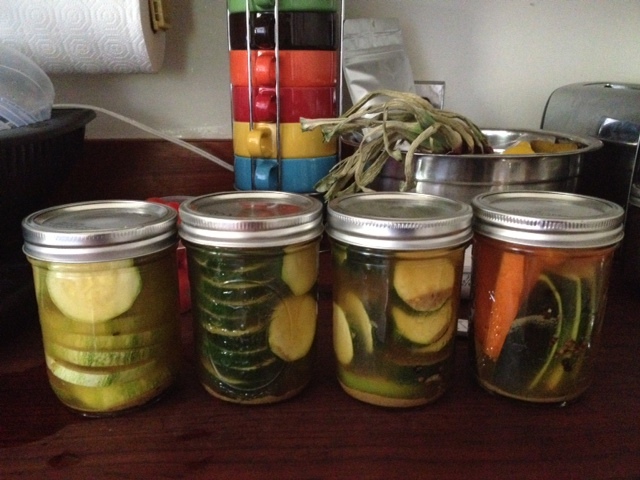 You can skip the canning process by putting pickles right in your fridge. They don’t last as long and they aren’t great for carrots which benefit from being cooked, but they’re ideal for zucchini which do not like the heat (key ingredient when pickling zucchini: cumin). It also make for an extra crunchy cucumber pickle. Apple cider vinegar and water in a 1:1.25 ratio (many recipes call for 1:1 – it’s up to you). Combine the water, vinegar, and salt in a pot and bring to a simmer. Cut your vegetables however you want them (slices or spears, or even whole). Drop 1-2 cloves garlic plus the spices you want in the bottom of clean ½ pint, pint, or quart jars (I usually use pints and use 5-6 peppercorns, part of a bay leaf, and sprinklings of everything else). 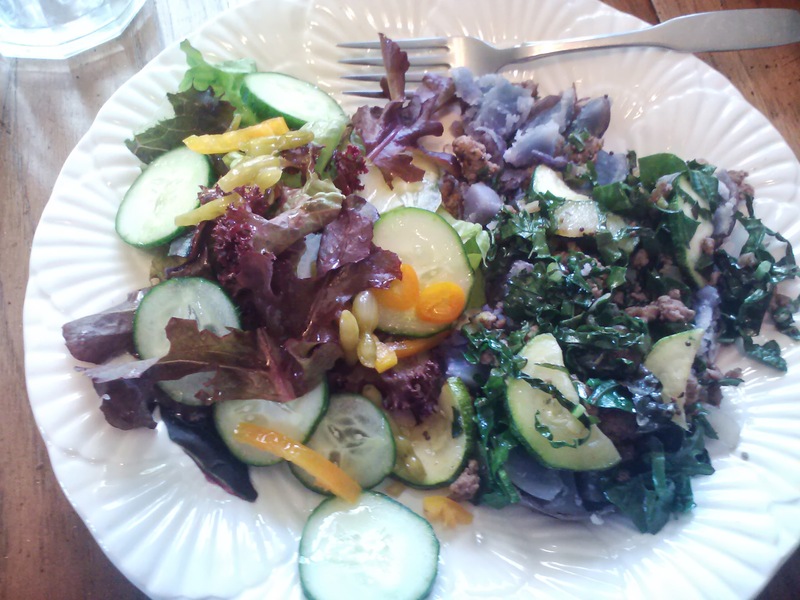 Pack your veggies in, including thin slices of onion if desired. Sometimes it’s easier to lay your jars on their sides and pack them horizontally. You want to leave about ½ inch of clearance between the top of your veggies and the top of the jar. 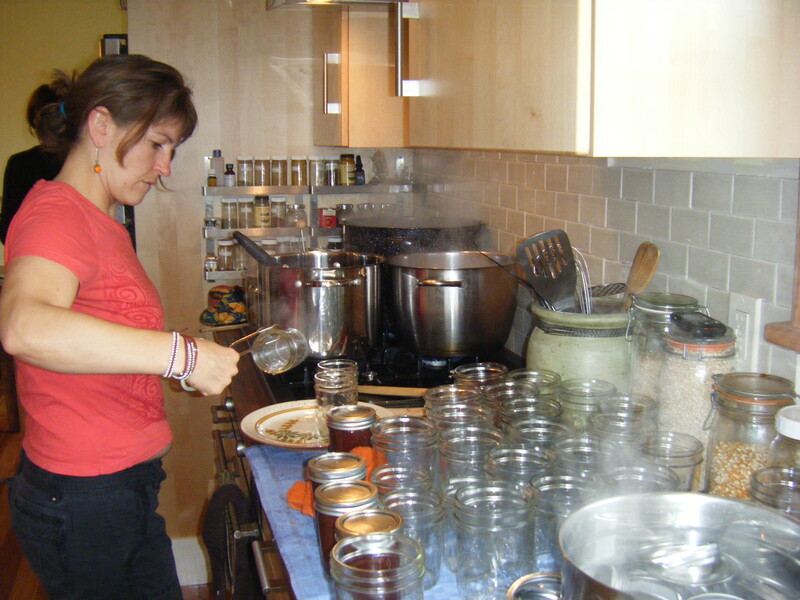 Once your jars are filled, pour the hot brine over them, leaving ¼ inch headspace at the top of the jar. I use a wide-mouth funnel so I don’t spill, but you could also transfer the brine to anything with a pour spout. Assuming these are refrigerator pickles, close them up with a lid and a ring and stick them in the fridge. 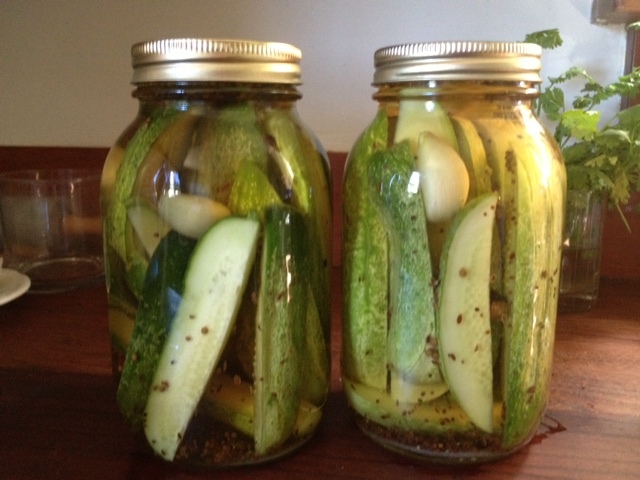 Most pickles will be ready in 24 hours, but will continue to get better after a few days. Tune in for Part II on how to actually can these suckers. 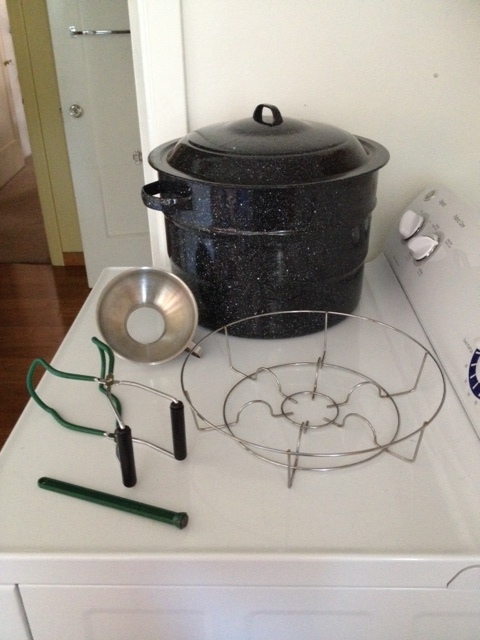 Categories: Guest blog, Preserving Food, Recipes | Tags: canning, cucumbers, how to make pickles, pickling, regrigerator pickles, vinegar, without canning, zucchini | Permalink. My family has had a couple weeks of sleeplessness, grief and gratitude. My beloved Gramps passed away on the eve of our sixth month of this project. I’ll write about him when I’m ready, but for now, here’s what my mom had to say. She is such a powerhouse I rarely get to surprise her. Her 55th birthday was July 5th, and she spent is burying her dad and flying home. She got up and went to work the next day. When she got home, I was there with dinner. Characteristically, she first cried, then put me right to work, and we made farm budgets over dessert. Also characteristically, in spite of all her other work, she took the time to write this. The warm practicality, grace, fierce love and strength of our matriarchy speaks through her, let it wash over you. It sounds like someone running dishwater while in the background your daughter, light of her grandpa’s heart, sits with your stepdad of 33 years, holds his hand and talks quietly to him. It sounds like kids running up the stairs, waking the patient, but he doesn’t mind. It sounds like kids always saying yes, always minding, always ready for a smile or some tears. It sounds like grownups remembering that kids need both, to learn how to make love rule in a family. It sounds like the laughter of lunatics, of people too tired to carry on who are carrying on anyway, and the absurdity of it all is like a drug in the system – bracing and mildly hallucinogenic. It sounds like voices singing “Happy Birthday” – badly but wonderfully – five days before the event because you are flying home in the morning. It sounds like the noise your mother makes as he looks into her eyes and she sees that he is gone – the saddest, most lost sound in the world. It sounds like your own voice cancelling your flight. It sounds like the telephone ringing – again, and again, and again. It sounds like your mother, strong matriarch in a family of strong matriarchs, inquiring after the needs of others. It sounds like a well-earned 21-gun salute, on your real birthday this time. It sounds like the beautiful voice of a daughter speaking a poem selected long ago, and like your own voice singing the song of good-bye – and not wavering even though everything inside of you is wavering and shaking. It sounds like the turboprop taking off directly after the ceremony and discharging you into the welcoming party of husband, daughter, and kids smiling and shouting to share the surprise as they sweep you into their arms. It sounds like a daughter’s voice on the phone, wondering where you are as you pull into your own driveway. It sounds like her laugh when you realize you are talking to her on your cell phone and looking at her truck in your driveway. It sounds like all of the million things we have to say to one another over a beautiful meal, delivered to an exhausted and soul-weary mom – fresh from the living earth, prepared by loving hands. A family where love rules is made up of people who truly see one another, hear one another, and serve one another. It is a family where the greatest single value is authenticity, beginning with the food we feed one another and the love in our voices when we serve it. 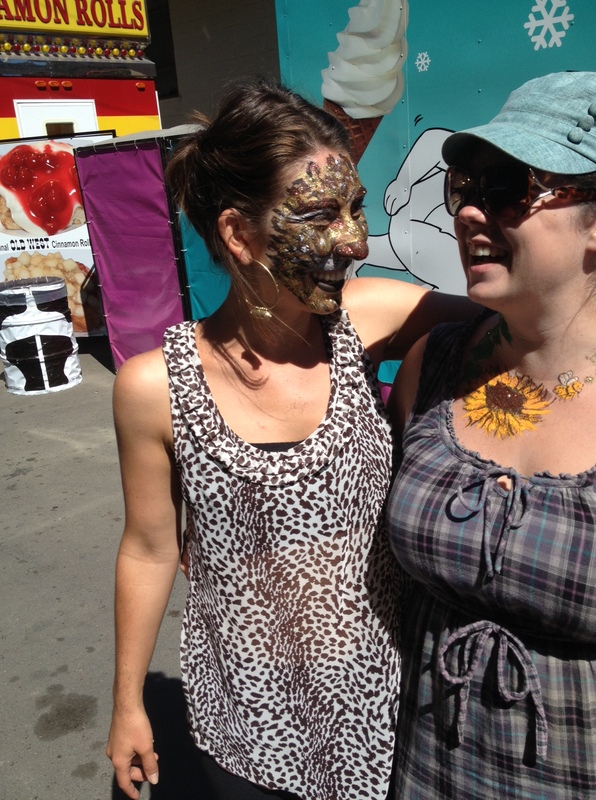 These are the ways we learn to inhabit our own lives. These are the moments we realize that truly we are fortunate. Fortunate. 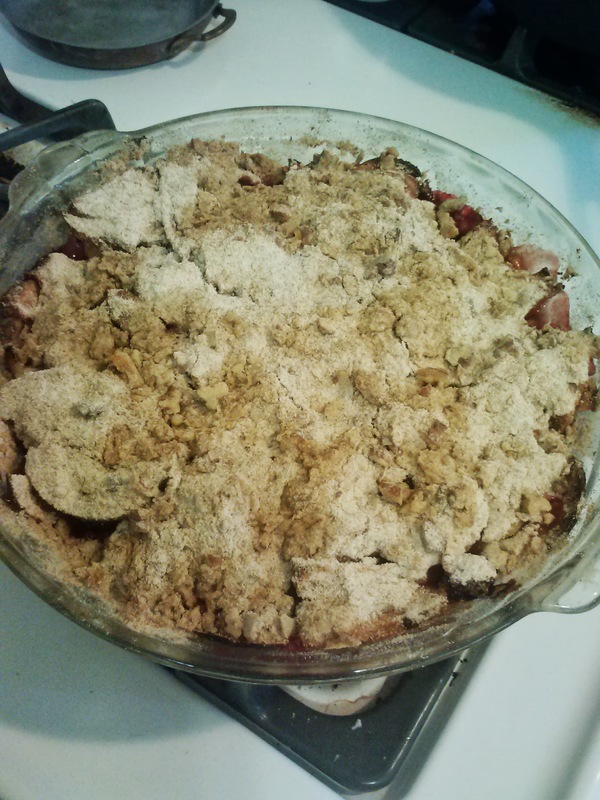 Categories: Guest blog, Musings, Uncategorized | Tags: family, grandpa, Mama Ellen | Permalink.